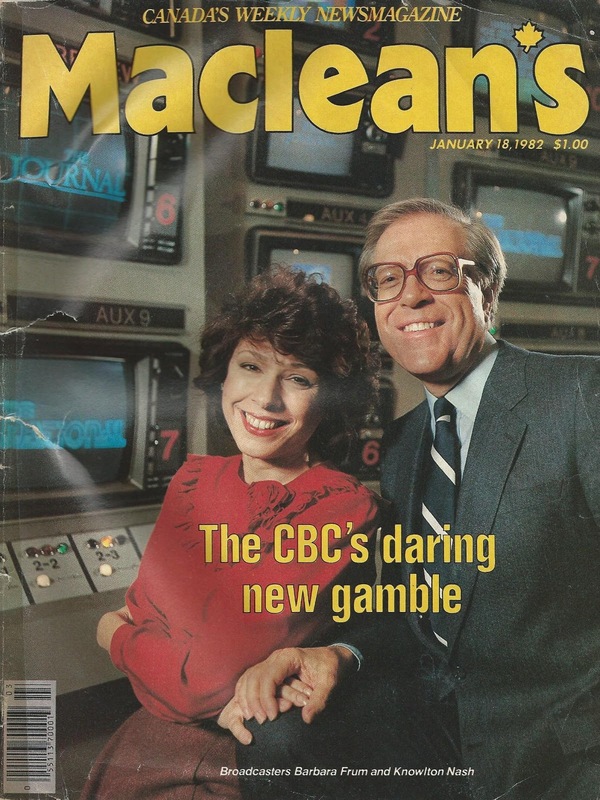 In January 1982 MacLean’s cover story read “The CBC’s Daring New Gamble,” and described the biggest programming risk a Canadian TV network has taken in the past 30 years. CBC decided to move its national news to 10 o’clock and follow it with The Journal, an in-depth current affairs segment. Maclean’s explained, “The public image of CBC television has rarely been worse. CBC’s share of the English-language audience has dropped from 34 per cent in 1967 to under 20 per cent and will fall even lower with the move to 10 p.m.” Thirty years later CBC’s audience share has fallen to less than 5%. CBC legends Peter Herrndorf, Mark Starowicz, Trina McQueen and Tony Burman designed the revolutionary concept around hosts Barbara Frum, Knowlton Nash and Mary Lou Finlay. The move had to be finessed through the CBC’s Board of Directors and when presented an audience forecast predicting the audience would increase significantly, Herrndorf said to bury it, since he had already convinced the Board that increased service to the public was worth losing audience. The audience for the 10 o’clock hour increased by over 50 per cent and may have saved CBC or at least bought it another decade or two. Not every gamble pays off, especially ones that ignore the odds. With bureaucrats in control of CBC a decade later, The National was moved to 9 o’clock with disastrous results. That mistake lasted one season. 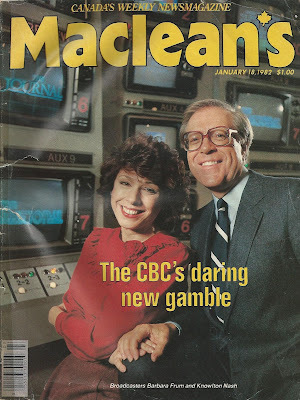 Ever since, CBC has steered away from taking risks and today builds its prime time schedule around programs that have been around for 40 years or longer: NHL hockey, local and national news, fifth estate, Nature of Things, Marketplace, Disney, Coronation Street, Hollywood movies, holiday specials and safe, middle-of-the-road entertainment reminiscent of programs the network aired in the 1970’s. Renewing 22 minutes for a 20th season or purchasing the rights to a proven series like Murdoch Mysteries or the Lang/O’Leary show are the riskiest programming moves CBC takes. Perhaps that is why CBC TV made little fuss about its 60th anniversary last September, which coincidentally was also the 60th anniversary of Canadian TV. Instead the network celebrated the 60th anniversary of Hockey Night in Canada. Why are Canadian broadcasters so reluctant to take risks? Does it explain why Canadian drama and comedy programs virtually never make the top 10? These questions have perplexed some very smart, creative people in Canadian TV for decades. 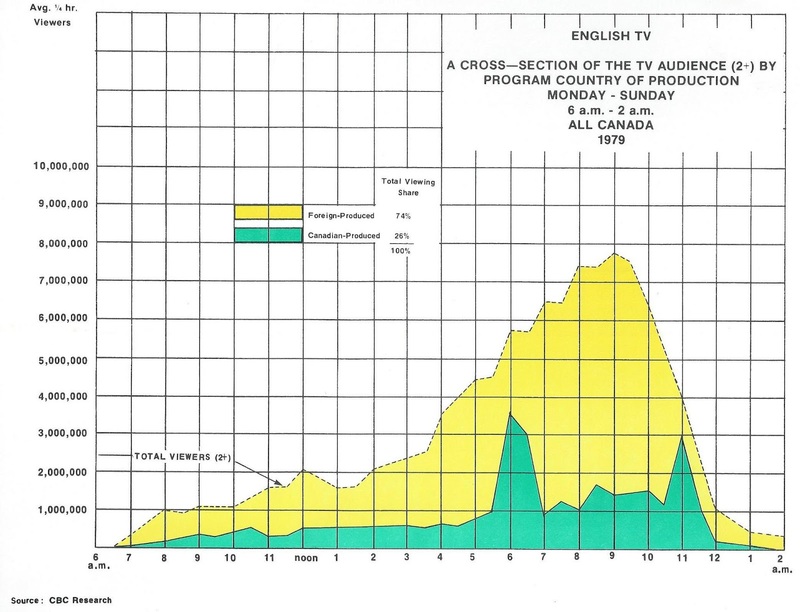 In the late 1970’s it led CBC to study trends in Canadian program audiences. 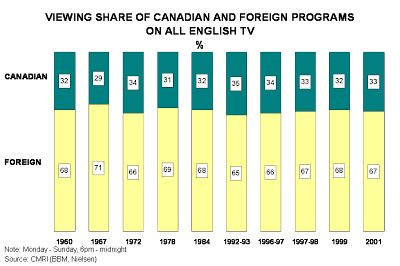 One of the findings that surfaced shocked senior management: the audience to Canadian programs had lagged U.S. programs since the beginning of TV in Canada, when CBC TV was essentially the only channel available to most Canadians. Further analysis revealed that in the 1950’s CBC TV relied heavily on shows like Ed Sullivan, Father Knows Best, Perry Como and I Love Lucy. These American shows attracted huge audiences with ratings of 20%, 30% or even 40%, numbers unheard of today, when a show with rating of 2% is considered a success. 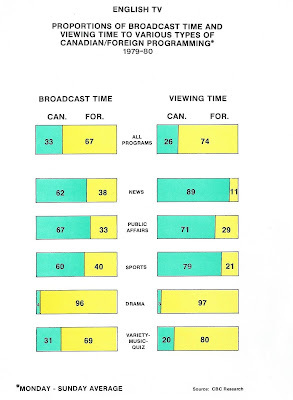 Here’s a snapshot from an old report showing that even in 1960, prior to the launch of CTV, U.S. programs captured roughly two-thirds of Canadian viewing (6pm-midnight). 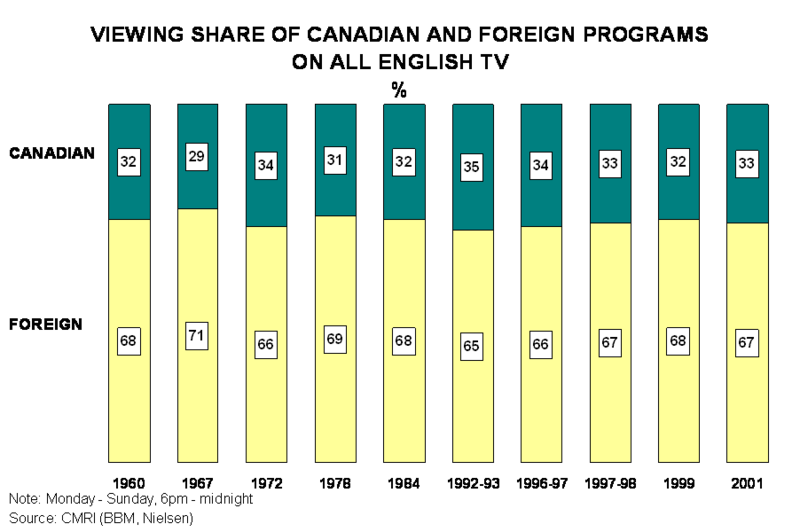 The 2:1 ratio remained constant through the 60’s, 70’s, 80’s and 90’s and is unchanged to this day, despite 60 years of trying. Over the years these efforts included the launch of dozens of new Canadian channels, the shift from free over-the air TV to pay TV, the creation of new funding sources, new funding agencies, tax incentives, billions of tax dollars provided to CBC and other broadcasters, regulatory incentives by the CRTC and numerous other measures. Incidentally, this ratio is almost exactly the opposite in French TV, where Canadian programming predominates, although even in French Canada U.S. drama and movies capture substantial audiences. Al Johnson, president of CBC when The National and The Journal were introduced, was one of those shocked by the audience data. He asked the research department to make large poster size versions of the chart below and presented it to members of Parliament. He launched a concerted effort to bring attention to the fact that Canadians were being swamped by a foreign culture. 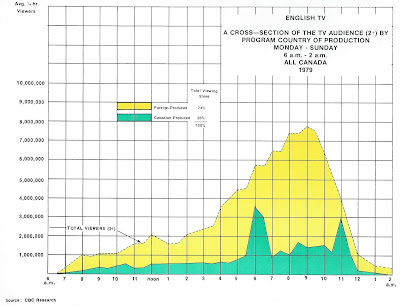 Only in the supper hour news period and late-night news period did Canadian programming account for a substantial audience share. In the heart of prime time foreign content crushed Canadian content. Ironically, a chart of viewing patterns in 2013 looks very much like the 1979 chart. Part of the reason that U.S. shows perform so well in Canada is that we import U.S. stations on cable and satellite and in recent years U.S. stations from all time zones have been made available to cable/satellite subscribers, permitting Canadian viewers unparalleled access to U.S. programs. Not even Americans are offered distant ABC, NBC, CBS or Fox signals from other time zones. Of course, all the Canadian stations, including CBC, also carry foreign programs, usually giving them prime time slots. CTV, CITY and Global prime time schedules are mostly American programs, scheduled to broadcast simultaneously with the U.S. networks. Many specialty channels are built around U.S. programs and even use the same names as their U.S. counterparts (OWN, Lifetime, History, Discovery…) So, while the resources put into Canadian programming have increased, they have been matched by U.S. programmers. Here’s another chart that Al Johnson presented to Parliament over 30 years ago. It shows the correlation between the amount of foreign programming in English TV and its audience share. Overall, some 67 per cent of programming available was foreign, so no wonder it captured a large audience share. Note that what is true today was true then: in news, public affairs and sports, Canadian programming accounted for a majority of the programming available and an even greater share of viewing in those genres. We have always been good at news, public affairs and sports and people watch in large numbers, being interested in what affects them directly. That was a key factor in the success of The National and The Journal. However, in drama and other entertainment we not only produced much less, we drew a ridiculously small share of the viewing audience in 1979 and that remains true today, as I have documented and confirmed annually in CRTC and CMF trending reports. Because drama and entertainment account for much more viewing than other genres, foreign programming continues to predominate. But it still leaves the question, why can’t we produce top 10 hits? The decades-long stranglehold U.S. programs have had on English TV, despite the efforts of Al Johnson and hundreds of other well-meaning executives and programmers over the past six decades, seems to be a permanent condition. It may be as inevitable as winter in a country that shares a border and a language with the largest economy in the world. Given that French TV can produce top-rated hits, the key factor is language and shared culture. An example: when a disaster strikes in the States, such as 911 or the Boston Marathon bombing, English Canadians flock to CNN. Ratings for Canadian news channels increase too but nothing compared to the CNN audience. For several weeks in September 2001 CNN was the number one network in Canada, capturing an audience share greater than any Canadian network. When major awards shows such as the Academy Awards or the Emmys are broadcast, celebrating U.S. movies and TV, they are without fail the most watched show of the night, if not the year. English Canadians are keenly interested in American culture and will tune to such quintessential American fare as Duck Dynasty, Storage Wars and Pawn Stars in greater numbers than Americans. This is not going to end whether or not we have hits of our own. One response has been to find excuses, arguments and rationales for the condition. A favourite tactic is to point out that there are many U.S. shows that have smaller audiences than Canadian shows. (Those soon get cancelled in New York.) Another is to say that promotion for Canadian shows can’t match the Hollywood publicity machine; this seems outdated given the role of social media today, plus the fact that research has shown many people just turn on TV and look for something to watch. A third is to blame broadcasters who are more interested in the revenues they receive from airing U.S. shows than in supporting Canadian programs. A fourth is to blame our small scale and the fact we can’t do pilots. When all is said and done, the fact is that only rarely does a Canadian show, other than news and sports, crack the top 10 program rankings issued week after week by the ratings agencies. There have been exceptions, such as Corner Gas or the first few weeks of Little Mosque on the Prairie but they are exceptions. Canadian TV doesn’t produce hit drama or comedy programs. 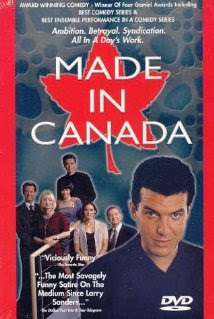 I have never watched a bad Canadian TV program. Canadians have produced some of the highest quality television in the world and there is much to be celebrated. We have the talent, witnessed by the many actors, directors, etc. in Hollywood. But we don’t have our own hit shows. The real reason that we don’t have our own hits is not talked about publicly. That is because producers and others employed in Canadian TV are reluctant to point the finger at the obvious reason. TV is a collective endeavour requiring writers, producers, actors, directors, cameramen, broadcasters, lawyers, accountants and many others. It is a complex business. But the best TV usually starts with one creative individual, be it a producer or a writer, someone with a creative idea for a series. In the U.S. individual creativity is encouraged by a system that recognizes that a successful series can make one rich. While there is a complex system of studio and network approvals, the individual creator is allowed to develop a series. In Canada, lacking the economy of scale and financial incentives, to try and compete with the U.S. we created a complex financing system that every producer must straddle before even dealing with the networks. If you want to produce a series in Canada you need to secure funding from Telefilm, the Canadian Media Fund, private funds set up by a cable or media company, as well as the network that will broadcast the series. Many TV producers in Canada are also lawyers or accountants for good reason. The financing system is so complex companies have been established to help producers through it. The funding agencies have incredibly complex guidelines and rules to determine who gets what share of the funds; they employ hundreds of people to administer the byzantine funding system. The money comes from taxpayers and cable/satellite subscribers, so the government, cable and media companies have an elaborate governance system that sets policy to distribute funds on a quota basis to ensure English and French, different regions, different media and different broadcasters receive funds. A good idea for a TV series is as likely as not to receive funding. The financing system is not only complicated and bureaucratic, it is geared to eschew risk. To get approval a producer needs pre-approval from a broadcaster and “envelopes” of funding are set aside based on historical factors including past audience performance, track records of the producer and the broadcaster. In other words, new producers are at a disadvantage and producers and broadcasters are encouraged to do what has worked previously, which means copying past formulas, using the same writers, actors, etc. Innovation is discouraged by the system; the programs that result are often good but not great. Change for a sixty year-old system is not easy and not welcomed by those who administer the system. I suspect that unless the system is changed to encourage risk taking, we will never achieve what Al Johnson wanted. Currently the funding required to make TV programs is held captive by the funding agencies and their bureaucracies. The solution to this might be a lot simpler than one might think. TV programs appear on TV networks. If the funds were provided directly to the networks, who after all should be good at spotting and developing talent, the need for the agencies would all but be eliminated and more efforts to innovate and take risk would result. There’s one problem. The reason that Telefilm and ultimately the CMF were created is that decades ago, even before the time MacLean’s published its article on The National/Journal, the government felt CBC had too much control of the TV industry and wanted to encourage independent producers, so it created Telefilm to provide funds to independents. CBC, whose budget was cut to fund Telefilm, didn’t want to be left out, so to access these funds, CBC agreed to broadcast a minimum percentage of independent production. Somewhat later cable companies were required to set aside 5% of all subscription revenue for another production fund and the government agreed to basically match these funds. The cable companies despised the notion of giving some of this funding to CBC and even withdrew funding at one point; reluctantly, CBC is given access to this fund today. So the government is providing two streams of revenue for independent TV production and cable/satellite companies provide another. The logical solution is for a portion of the government funding to go directly to CBC, exclusively for independent production and matched by internal CBC funds. The rest of the government funding and the 5% cable fund should be provided directly to the private TV networks, for use by independent producers, and matched by private networks. Conveniently, all the private networks happen to be owned by cable/satellite companies. The government’s only role would be to audit the system. No bet is a sure thing but removing the bureaucratic funding agencies and providing production funds directly to networks would increase the appetite for risk, put the decision making in the hands of programmers, ensure all the funds go to programming and maybe create some hits of our own. The CBC might even take a few chances. After 60 years, too many people are invested in the system as is to actually change it. Risk is tied to cost, the less things cost the less riskier they are. Unfortunately, the system is set up to wring as much money out of it as possible before a series even goes to air. Several years ago, I received $5,000 in seed money from the CBC's Transcanada Development Fund to help develop a half-hour comedy series shot in Yellowknife. Working with local cast and crew, I was able to come up with a budget of $50,000 per episode x 9 episodes = $450,000 for a season. Some fantastic features have been shot for less, and our crew included Gemini and other award winners. Here's the thing: A show like Little Mosque costs $500,000 per *episode*. Sure, our show would have been a little grungy and DIY, but enough people watched Trailer Park Boys and Kenny vs. Spenny to keep those shows around for years. You can't actually shoot for CBC - even if everyone on board is willing to get paid $25-40/hrs - because of its agreements with ACTRA and the like. Reading over the ACTRA rules and regulations, my eyes always glaze over. You are 100% correct that lawyers and accountants become more important than creative types simply to navigate the byzantine system we've established. Ironically, the organizations set up to protect actors and crew are part of what stifles the creative process. Networks can't be throwing out $500K to $1M per episode to see what sticks and those working in the industry miss out. Canadian Media Research Inc. (CMRI), an independent research company, was established in 2001. CMRI has undertaken research for such clients as CTV, Global, ZoomerMedia, Nielsen Media Research, IPSOS, Canadian Media Fund, Bell TV, Shaw Cable, Rogers Cable, Telus, CMPA, Pelmorex, Heritage Canada, the CAB, the CCTA, Knowledge, Friends of Canadian Broadcasting, CMG, TSN, Sportsnet, Discovery, A&E, TBS, CNN, CPAC, Omni, NFB, the Senate of Canada, Telefilm, SOCAN, CRC, CRTC, CBRA and many independent TV producers. Barry Kiefl was Research Director for the CBC from 1983-2001.